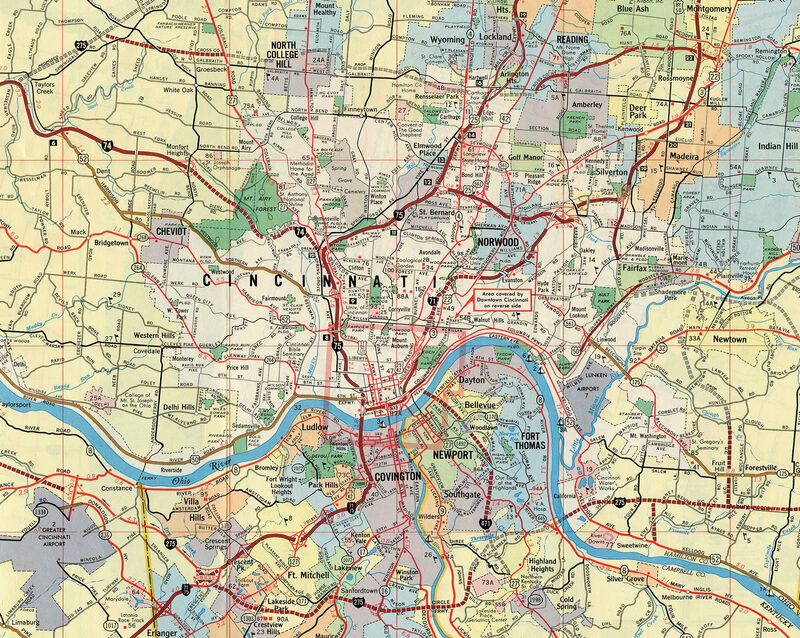 Interstate 275 follows the Donald H. Rolfe Circle Freeway around the Cincinnati, Ohio metropolitan area. The beltway runs concurrent with a 3.45-mile section of I-74 and spans the Ohio River across two high level bridges. I-275 is the only branch route within the Interstate Highway System to enter three states. Furthermore, I-275 in Indiana is the only instance a branch route entering a state in which its parent route does not. The Circle Freeway mostly acts as a commuter route for Cincinnati/Northern Kentucky International Airport (CVG) and the various suburbs of Cincinnati, Ohio and Covington and Newport, Kentucky. 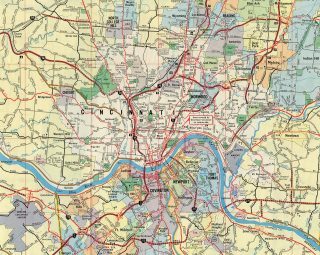 The beltway also provides a bypass from southeast Indiana to Northern Kentucky and part of an alternate route around the Brent Spence Bridge of I-71/5 across the Ohio River. The westbound direction of Interstate 275 was shown as complete between the four-level interchange with I-71/75 at Erlanger and KY 212 to then Greater Cincinnati Airport. The remainder of the beltway in Kentucky was under construction or proposed. Button copy guide signs posted a half mile ahead of Exit 43 for Interstate 75. The forthcoming exchange lies 42 miles south of Dayton. Photo taken by Don Hargraves (12/02). Interstate 275 westbound maintains three through lanes through the directional cloverleaf interchange (Exit 43) with I-75. Photo taken by Don Hargraves (12/02). A loop ramp (Exit 43A) joins I-75 south to Cincinatti from Interstate 275 west. The Circle Freeway continues into the city of Springdale. Photo taken by Don Hargraves (12/02). I-275 proceeds 1.25 miles east from the six-ramp parclo interchange (Exit 42) with Ohio 747 by Tri-County Mall in Springdale to Interstate 75. Photo taken by Don Hargraves (12/02). Exit 43 departs with two lanes from I-275 east for Cincinnati and the northern suburbs of Arlington Heights, Rensselaer Park and Saint Bernard. Interstate 75 reaches Downtown in 16 miles. Photo taken by Don Hargraves (12/02). Interstate 75 travels 44.5 miles north from the Circle Freeway to meet I-70 at Vandalia. I-275 proceeds east five miles to I-71 at the city of Blue Ash. Photo taken by Don Hargraves (12/02). Interstate 75 enters the city of Sharonville at Exit 15, 1.25 miles ahead of I-275 (Circle Freeway). The northern arc of the Cincinnati Beltway serves the communities of Northbrook, Forest Park, Springdale, Sharonville and Loveland. Photo taken by Don Hargraves (12/02). Interstate 275 combines with I-74 west in 15.2 miles at Miamitown. Eastward the Circle Freeway continues 29.6 miles to Kentucky state line on the Combs-Hehl Bridge. Photo taken by Don Hargraves (12/02). I-71 and I-75 combine 11 miles northward from the city of Walton to the four-level interchange (Exit 185) with Interstate 275. Photo taken 11/13/04. Northbound I-75/71 reaches Exit 184 for Kentucky 236 in the city of Erlanger. Ramps for the Circle Freeway east follow in 0.6 miles. Photo taken 11/13/04. A lane drop occurs at Exit 185 along northbound for I-275 east to Taylor Mill, Wilder and Interstate 471 at Highland Heights. Photo taken 11/13/04. Interstate 275 (Circle Freeway) ventures northwest from Erlanger to Cincinnati/Northern Kentucky International Airport (CVG), Hebron and Idlewild. Photo taken 11/13/04. Exit 185 combines with an entrance ramp from KY 236 ahead of the high speed ramps to Interstate 275. I-275 wraps around the Cincinnati area west to Lawrenceburg, Indiana and east to the suburbs of Cherry Grove and Mount Carmel. Photo taken 11/13/04. I-71/75 wind westward through Fort Mitchell and Crescent Springs to KY 371 (Buttermilk Pike) at Exit 186. The systems interchange with Interstate 275 lies just beyond the Erlanger city line. Photo taken 11/13/04. Interstate 275 (Circle Freeway) crosses I-71/75 west from the city of Crestview Hills to Cincinnati/Northern Kentucky International Airport (CVG). Photo taken 11/13/04. One half mile ahead of the ramp separation (Exit 185) for I-275 west to Lawrenceburg, Indiana and east to Highland Heights. Photo taken 11/13/04. Two lanes depart I-71/75 south for the Circle Freeway at Exit 185. Photo taken 11/13/04. The four level interchange joining I-71/75 and I-275 was constructed in 1977. Photo taken 11/13/04. A collector distributor roadway joins westbound I-275 with KY 1303 (Turkeyfoot Road) and U.S. 25-42-127 (Dixie Highway) one mile ahead of I-71/75. Photo taken 11/13/04. Interstate 71 travels southwest from the greater Cincinnati area to Louisville while I-75 ventures south to Lexington and Knoxville, Tennessee. The two routes combine northward 18.6 miles from Wilder to Downtown Cincinnati via the Brent Spence Bridge. Photo taken 11/13/04. Exit 83 separates from the Circle Freeway westbound at the Hulbert Avenue / Crescent Springs Pike overpass in Erlanger. Photo taken 11/13/04. Interstate 275 Cincinnati. http://www.cincinnati-transit.net/I-275.html Cincinnati-Transit.net (Jake Mecklenborg). “I-471’s birth slow to come – Plans and routes changed many times.” The Kentucky Post (Covington, KY), November 30, 1998. “Pieces of the past – Gold and silver anniversaries.” The Kentucky Post, May 24, 1993. “I-275 Changed Face of Northern Kentucky.” Kentucky Post, The (Covington, KY), July 8, 2002. Page updated September 27, 2016.